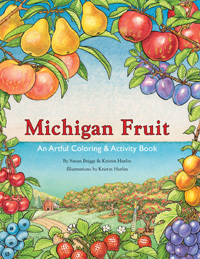 Michigan Fruit Coloring & Activity Book takes you on a fruitful journey through the Michigan fruit growing season with history, lore, recipes, beautiful pictures to color, and a map and list of Michigan fruit festivals. Beginning with strawberry (the first fruit of summer) and ending with the grape, two pages are devoted to each fruit. On the left side is an information page that includes history, fun facts, locations where the fruit grows most abundantly in Michigan, examples of different varieties and use suggestions. There is also a picture border (to color of course!) that runs along the left edge of the page. The border shows the progression from seed to blossom to mature fruit. There is also a “language fruit” image that will teach you how to say the fruit in several other languages. On the right side is a full page picture of the fruit in its growing environment.